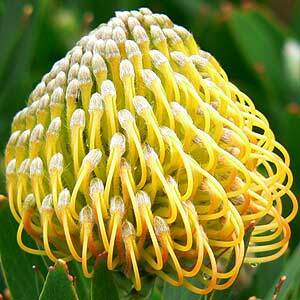 Leucospermum have attractive spiky yellow, red and orange flower heads and contrasting grey-green foliage. These fantastic flowering plants can be used to make a mass display that will attract birds to your garden. The height of individual species and cultivars varies, from low growing types such as the L. oleifolium which will reach around 1m, to taller growing L. pattersonii which can get to 3m. leaf pincushion a prostrate form with creamy flowers. Plants can take 2-3 years to begin producing masses of flowers. Cultivars and hybrids such leucospermum cordifolium x glabrum (picture right) have much improved flower forms and are winners in any garden. Others to look for include ‘rigoletto’, ‘carnival red’ and ‘carnival copper’. All are tolerant of coastal conditions, and are drought tolerant once established. Poor soils are no problem although they will grow a lot better in a humus rich well drained soil. 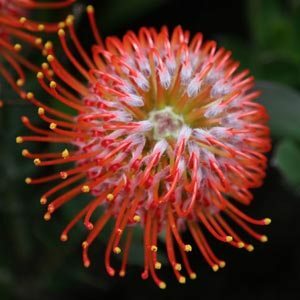 With long lasting vibrant and colourful flowers from spring through summer, requiring little maintenance and ideal for both the garden and containers, Leucospermum are well worth a place in the garden. Do not fertilize, or use a very weak low phosphorus fertilizer, during growth periods..
Do not water in summer unless you have a very long hot dry period. Only water in the evening. Remove spent flower heads always leaving good leafy growth on the stem. Other stems can be taken back to a similar height. Remove any weak stems that are ‘floppy’ or not upright. 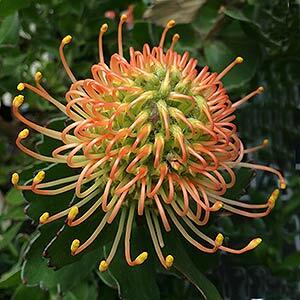 Leucospermum are another valuable garden plant from the Proteaceae family. Widely used in landscaping with excellent drought tolerant properties and attractive flowers. Leucospermum Cordifolium (picture right) with its stunning yellow to orange flowers depending on cultivar is an outstanding bird attracting plant, flowers also are great as cut flowers and are used widely in the florist industry.